It’s not every day that an all-day music festival comes to Portsmouth, New Hampshire. A quaint, little town right on the water, known for its cobblestone roads and eclectic restaurants, played home to the Second Annual New England Country Music Festival presented by The Harbor Agency on Sunday, August 7th. The venue? Redhook Brewery. The weather? Sunny and 85 degrees. The beer? Hoppy and strong. The headliner? 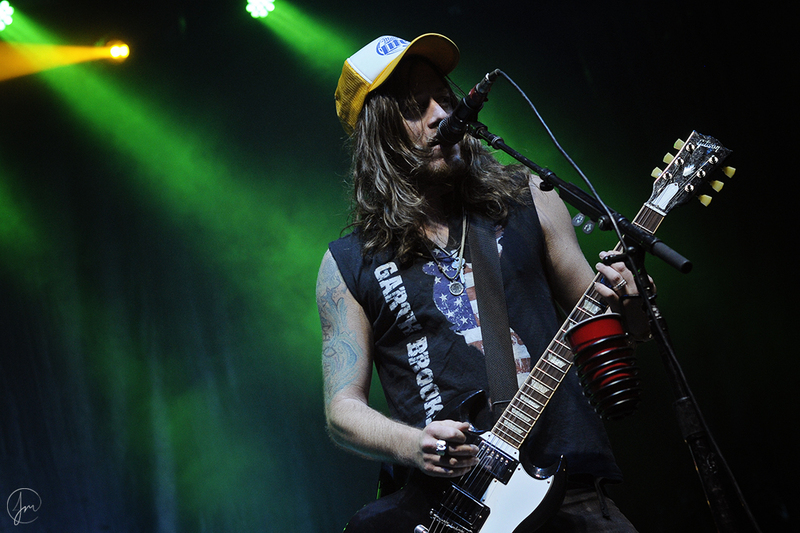 The Cadillac Three. For a day where Nashville meets the North, fans came from hours away to listen to their favorite acts and enjoy food trucks of all types. After a morning filled with sound checks, Jimmy Connor was set to take the stage at 1:30 PM. Coming onto the stage, Jimmy got the Portsmouth crowd excited from the beginning. Jimmy walked up to the microphone with his guitar in his hand and exclaimed, “Y’all ready to party? I know I am!” From cover to cover, there was not a beat that Jimmy missed. Opening his set with ‘Take It On Back’ by Chase Bryant, Jimmy had the crowd singing as soon as they were walking in the gates. Jimmy immediately went to ‘Barefoot Blue Jean Night’ by Jake Owen and everyone was singing along. Before going into his next song, Jimmy told the crowd, “through this musical journey of mine, he has been a great brother to me.” Jimmy was referring to Hunter Hayes, as he broke into singing Hunter’s song ‘Wanted.’ Jimmy talked about his recent experience at the WKLB Festival, and how honored he was to play the side stage and open for Darius Rucker and went into singing ‘Wagon Wheel’ and ‘Chicken Fried.’ It wasn’t all just covers for the 16-year-old, he also played his debut single, ‘Callin’ It,’ which fans can download on iTunes and Spotify. Preparing the crowd for a long day of country music, Jimmy ended his set with ‘Someone Like You’ by Keith Urban. After Jimmy’s set, Portsmouth knew they were in for an exciting day of talented artists and great country music. Photo by Drew Donabedian Photography. Following Connor was another Massachusetts artist, eighteen-year-old Caroline Gray. This year has been big for her. Caroline has had the pleasure to sing the National Anthem at Fenway Park and opened for Darius Rucker at the Xfinity Center. Her first song, the Kelsea Ballerini hit, ‘Dibs,’ was performed with such enthusiasm and excitement that she broke a string on her guitar! The crowd loved her rendition and were soon singing along. Caroline performed eight songs during her set. Some were songs by other artists and some were Caroline Gray originals. Some of the tunes performed were, ‘Get Down,’ ‘UPS,’ ‘Hemingway,’ and her new to be released single ‘Red Light Kissing.’ Caroline explained the song as, “the awkwardness of kissing a boyfriend/girlfriend at a red light and continuing to kiss even after the light has already turned green.” Caroline ended her set and introduced her last song; “I have time for one more song. I think you might know it, ‘My Church.’ Caroline’s performance of Maren Morris’ debut hit was incredible and the perfect song to pump up the crowd up for the next act to take the stage. Keeping with the local acts, Houston Bernard and his band treated the crowd to a nine-song set, full of songs from their latest album ‘Knockin’ Boots.’ They started their set off with a song fitting for the day, ‘Country Crowd.’ They really got the crowd moving with the up-tempo song ‘Yoga Pants,’ a song which always has fans laughing. They also performed their songs ‘Home is in Your Arms,’ ‘Ready to Leave,’ ‘Shut Up and Kiss Me,’ and ‘It Ain’t Gonna Drink Itself.’ Much to the delight of the crowd, Houston threw out some t-shirts and hats as he told fans to go the merchandise table after his set so he could meet them in person. Houston and his band ended their upbeat set with the title track off their latest album, ‘Knockin’ Boots.’ Houston kept the crowd engaged during the entire performance with his ever present smile and dancing all over the stage as he sang. 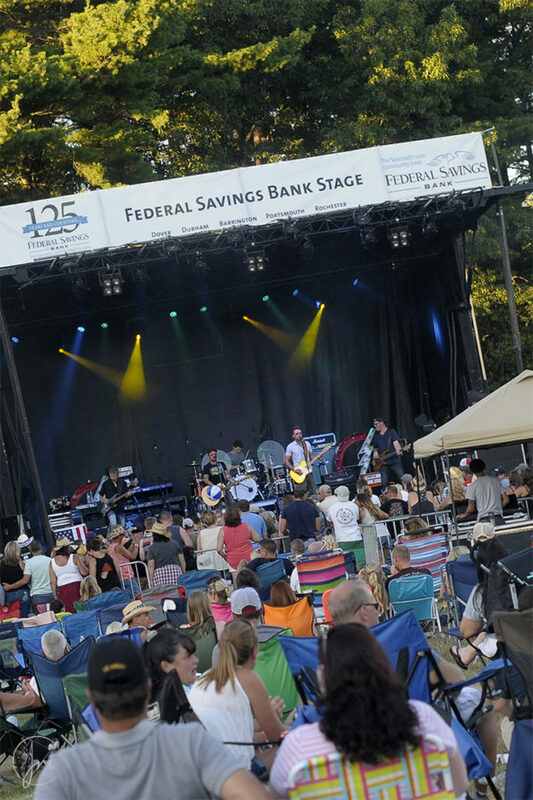 One of the two acts to return to the Federal Savings Bank Stage, Martin and Kelly serenaded the growing crowd to an eclectic set list, making sure to cater to all types of music fans. Always with a smile on their faces, local artists Jilly Martin and Ryan Kelly never fail to entertain their listeners. 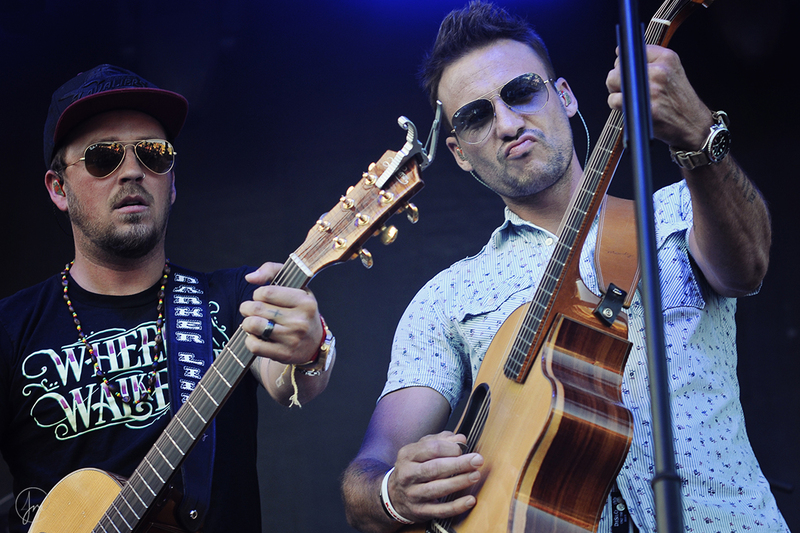 The duo kicked off their time in the Sunday afternoon heat with their song, ‘Trainwreck,’ off their self-titled EP. Jilly got the crowd laughing as she braced them for Joey + Rory’s song ‘Cheater, Cheater’ up next. “My momma told me I could sing this song,” she explained. “There are some words I’m not so sure about, though.” This proved to be a real hit with all the ladies listening, as they sang and danced along. Personable as usual, Martin talked a little more to the crowd. “I’m sure there are some people in a relationship out there. And sometimes, they get on your nerves.” Heads shook in agreement, as Jilly looked over to Ryan, who was getting ready to play another song off their EP, ‘I’m Gonna Kiss You.’ “We like to sing country music, but sometimes we like to change it up a bit.” The anticipation grew for what was next. It was their cover of Avicii’s popular tune, ‘Wake Me Up,’ another song that got the fans dancing on the field of Redhook Brewery. It was ‘Young, Broke and Beautiful’ next on the set list off their EP, a melody depicting the American dream couple in love who just need each other in this life. To wrap up their time on stage, the duo slowed it down as Jilly moved in closer to Ryan and they sang a beautiful rendition of the lullaby ‘You Are My Sunshine,’ as they left the stage leaving fans wanting more. 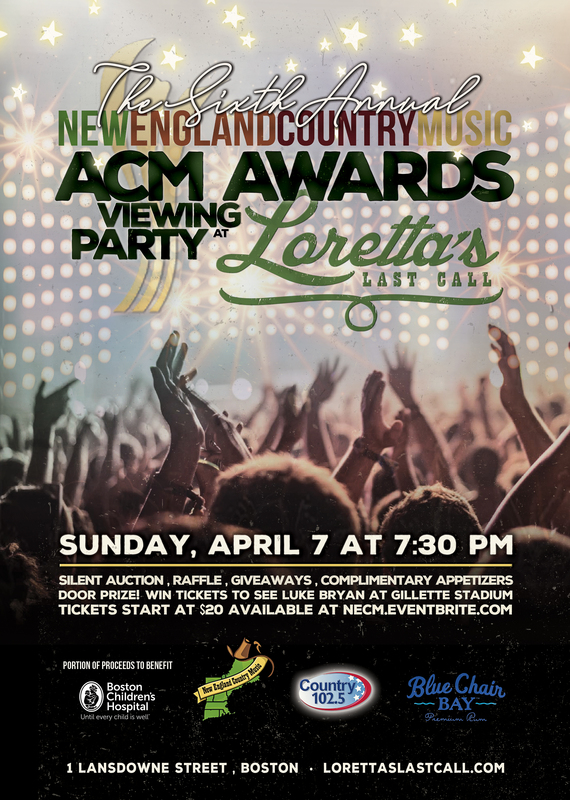 Luckily for New England country enthusiasts, Martin and Kelly travel the Northeast with several shows a week, a fan’s opportunity to catch more. 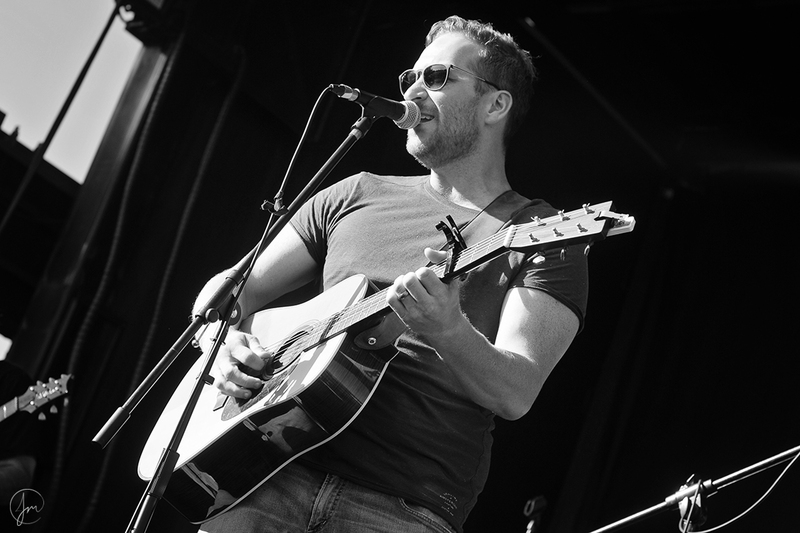 Up next was another returning artist, Massachusetts native Alec MacGillivray. Alec was a fan favorite last year playing acoustic between acts, but this year he had a set with his talented full band. He opened with his popular song ‘Tom Petty’ and got a huge applause from the crowd when he ended it replacing the lyric “Tom Petty” with “Free Brady.” After this he played the only cover of his entire set, appropriately the Tom Petty song, ‘American Girl.’ One early highlight of the whole day was the crowd being fully engaged singing along and loving Alec’s new single, ‘Bad Day to be a Bud Light.’ The upbeat and fun song, has a lot of room for audience participation with many “aaaaa-ooo”s to sing along with. The NECM festival crowd did not disappoint in their role on backup vocals. Alec, who recently moved to Nashville, then played his craftily written ‘Mascara Stains’ before wrapping up with his most successful song to date ‘Wild and Crazy.’ This year, fans were treated to the full Alec Mac experience, as he and his band gave it their all on the stage. Photo by Justin Mayotte Photography. 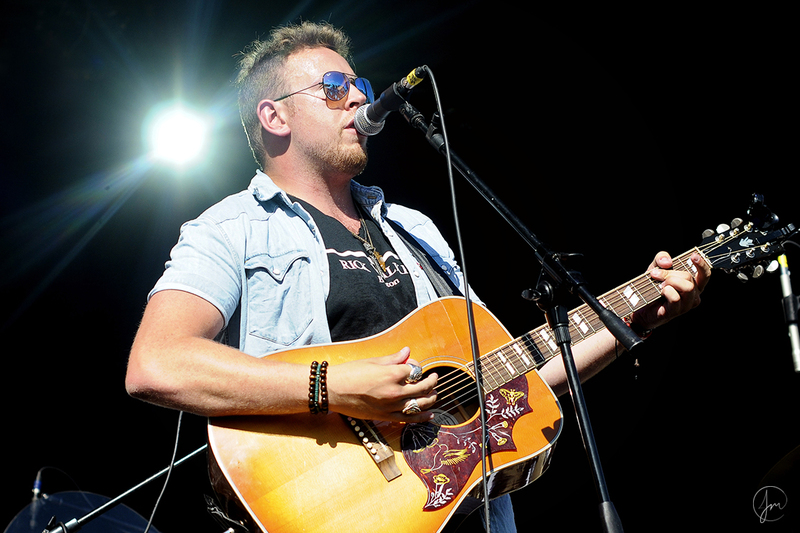 At 5:00 PM, Morgan Myles was the first of our national acts to take the stage. Her band began to play music, capturing everyone’s attention as Morgan stepped on stage and greeted the crowd, “What’s going on y’all? 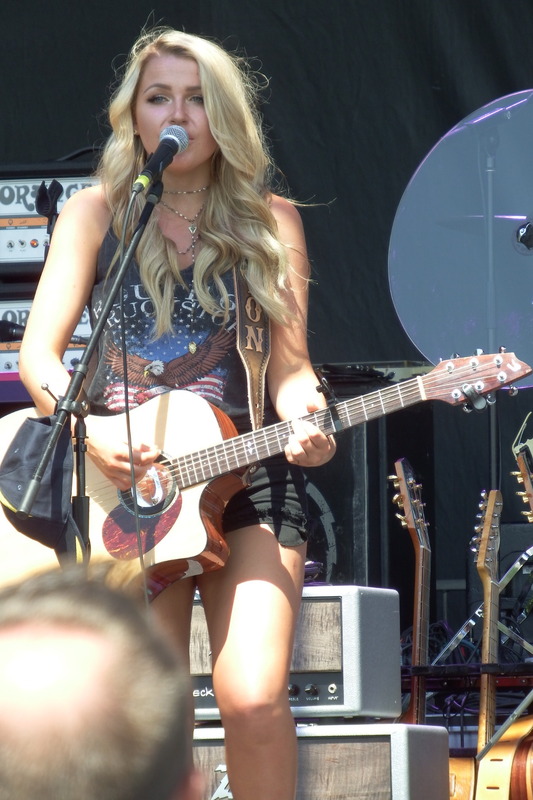 New England Country Fest!” she exclaimed, before opening her set with her own ‘Chains.’ Her performance was full of energy from the start as Myles stomped her feet, flipped her blonde curls, and paraded across the stage. But the moment that had everyone hooked was when the music dropped out and Morgan belted the chorus acapella. The song concluded with loud cheers and whistles from the crowd as Morgan transitioned into ‘We Won’t Go Home’ from her EP, ‘Miss Morgan Myles.’ Before beginning the song, though, she taught the New England Crowd some Nashville slang. “Holler and Swaller,” she explained is a common phrase used around Music City which is essentially a way to cheers. First you holler (shout), then you swaller (drink). “Let’s try it,” Morgan began, “Holler…” the fans all screamed, “and Swaller…” she said and everyone raised their drinks and took a big sip. “I know it’s hot out there but we got alcohol, we got Love and Theft, we got The Cadillac Three. Yeah, nobody’s going nowhere!” she said, and began to play her party anthem ‘We Won’t Go Home.’ “How’s everybody doing out there?” Morgan exclaimed as the song ended. “The very first song I ever played on guitar, how I learned to play guitar, was a Bonnie Raitt song. It’s called ‘Love Me Like a Man.’ Here’s to all the ladies who have men that know to treat them right,” Myles said introducing her cover of the aforementioned song. About mid-way through the 70s classic, the singer shouted, “Hey guys you know what time it is? 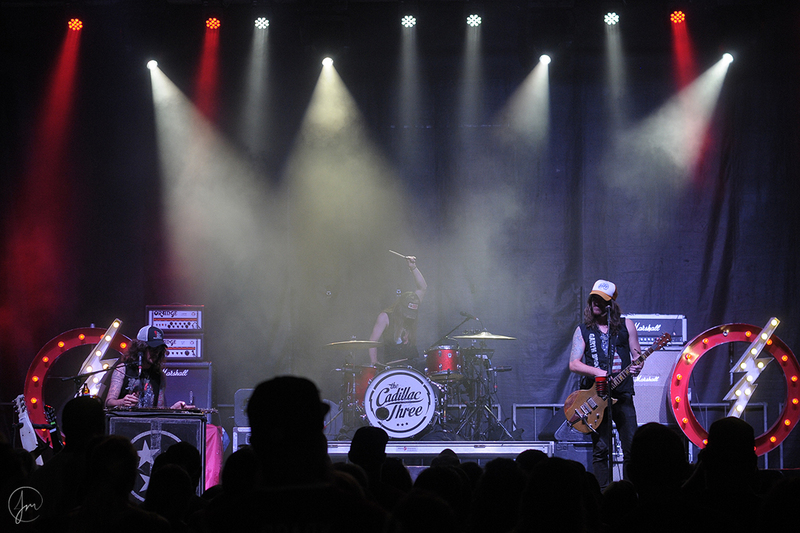 Double time!” The band picked up tempo and the crowd clapped and stomped along with the beat. As the song ended Morgan followed up with another cover that kept with the 70s theme. “You know that woman in country music that has that big blonde wig? Sings really funky country music?” she asked, “It’s time we pay a tribute to miss Dolly Parton,” exclaimed the singer and she performed the superstar’s chart-topper, ‘Jolene.’ As the song concluded Myles said, “So guys, I figured out who Jolene is. I made a song called ‘Adeline’ and it’s her granddaughter.” It’s a sassy song that calls out a cheater with lines like, “Where were you the other night and who the hell is Adeline?” Morgan’s voice will give you goosebumps, especially around the two and a half minute mark. She belted out the line, “Let’s get it done,” and the crowd erupted into applause. Myles rounded out her 30-minute set with her own ‘Whiskey Dreaming’ – a song that called for some audience participation. She asked if the crowd would help out by singing some ‘oohs’ in the chorus. After a couple rounds of practice, we were ready to go. The fans were crazy about her performance, as the song ended there was an outburst of applause. It was a performance worthy of a standing ovation except practically everyone was already on their feet. Myles thanked the crowd one last time and announced that she was heading over to her merchandise table for an informal meet and greet. Morgan’s energy on stage and her unmatchable powerhouse vocals set the bar high for the rest of the evening’s acts as everyone was completely blown away by the singer. Between her talent and passion for music, it’s clear that this is what Myles was born to do. From one Nashville recording artist to the next. 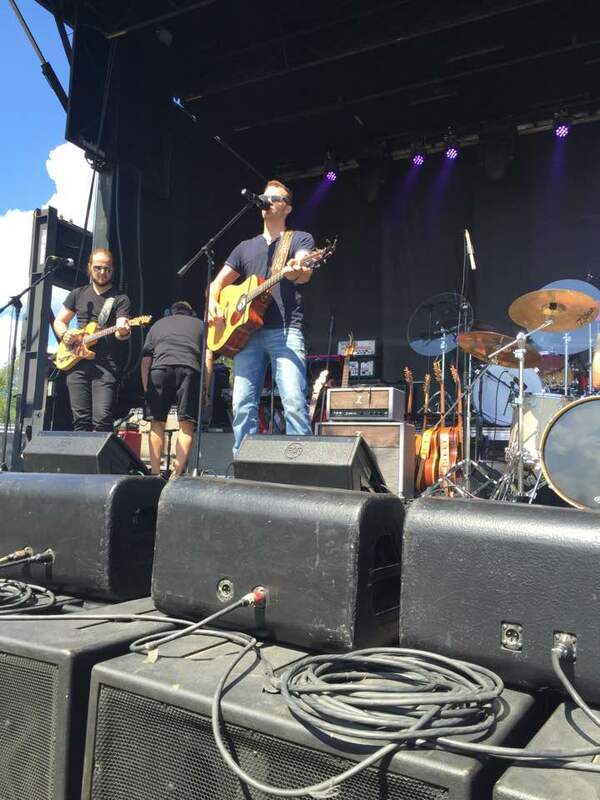 The crowd got just about as loud as it would all afternoon as The Voice finalist Barrett Baber took the stage. Him and his band got right to business playing the very danceable ‘6 Beers and a Dream.’ Next was ‘Somethin’ ‘Bout The Summertime,’ which he proudly pointed out is featured on Coke cans all over the country. 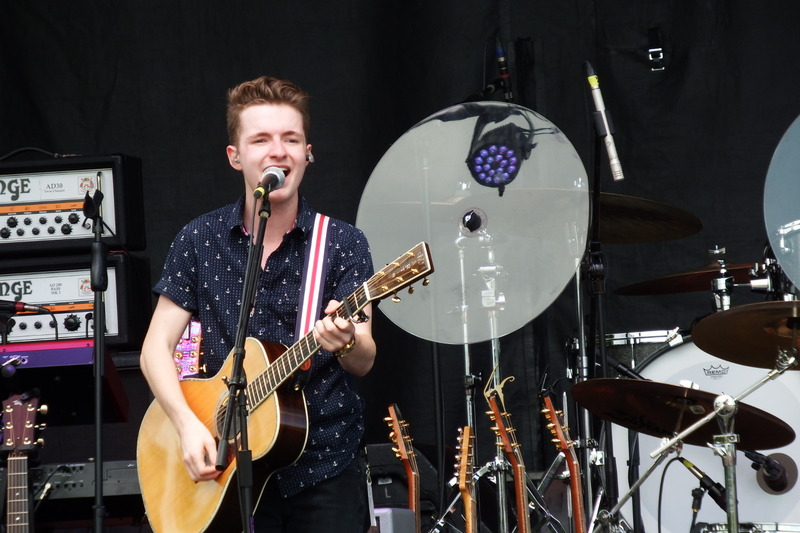 Barrett then busted out his soulful side for the first (of many) times on ‘Tipsy on Wine’ before playing his new single ‘Kiss Me Hello.’ After that he took a moment to thank the crowd for being there. He got a bit emotional explaining that around this time last year he was getting ready to go back to work as a high school teacher in Arkansas and here he is a year later, playing for a massive crowd 1500 miles from home. “I know how hard you work for your money. To spend it to come to something like this and put diapers on my kids means so much.” After ‘Reckless Love,’ which he says will appear on his new album, he played three of the songs he covered on The Voice, ‘Walking In Memphis,’ ‘I’d Love to Lay You Down’ and ‘Delta Dawn.’ Barrett’s band left for a bit allowing him to shine acoustically on ‘I’d Love to Lay You Down’ before they came in to ramp it up at the end and transition into ‘Delta Dawn.’ After he finished, Barrett lingered on the stage, massive smile still on his face, seemingly not wanting the mutual good time him and the audience were having to come to an end. We think Barrett will continue to have no problem entertaining the crowds thousands of miles from home, just as he proved here in Portsmouth. It’s 7:00 PM, the sun is still shining but is not as brutally hot as it had been for the previous sets. The crowd is ready. They’re cheering “Love!” “Theft!” repeatedly. Finally, the guys appear on stage wearing matching Raybans and rocking matching guitars. They opened with ‘Can’t Wait For The Weekend’ to a very happy crowd. The set continued when they played ‘Runnin’ Outta Air’, and ‘Tanlines’, which was written on a beach in Florida. During this time Stephen signed beach balls for the fans and stood on speakers right in front of the gate to interact with them while Eric rocked his guitar and vocals. ‘Tanlines’ then mixed in a ‘No Woman No Cry’ rendition. They continued with ‘Night You’ll Never Forget’ and a cover of ‘Folsom Prison Blues’ by Johnny Cash. The following song that was played is the potential new single off of the guy’s new album. It is titled ‘Candy Land’. Once they started playing, the crowd went nuts. The reaction from the audience was positive. There was much dancing, cheering and smiling coming from everyone watching the performance. 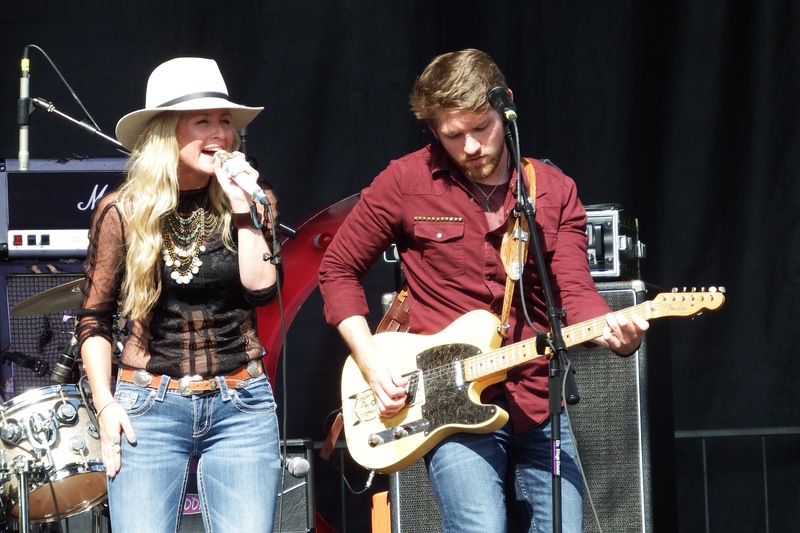 The twelfth song in their set list was set aside for the first song they ever put to country radio, ‘Runaway.’ A familiar song with many people, a sing-along came from the crowd and more dancing. In this song the guys had a spot for some guitar solos which rocked the stage. Following suit was their latest single ‘Whiskey On My Breath.’ “This is our most important song ever put out to country radio or on an album. It’s about addiction. Eric and I have lost loved ones to addiction, and last week we lost a close friend to it,” Stephen said soft-toned. When they started performing you could feel how passionate they were about this song and how deeply it affected them and how strongly it meant to them. At the end of the performance, Stephen tipped his hat to the crowd. From beginning to end there was a solid hour and a half of partying that was turned up 10 notches when the main act came to stage. Just as the sun was setting after a hot Portsmouth, New Hampshire day and just when the audience thought they had seen everything NECM had to offer, The Cadillac Three marched on stage to a left to right chant of “Cadillac!” “Three!” Their set started with a hard guitar solo which led into the song ‘That Girl’s On Fire.’ ‘I’m Southern’ rolled next with Jaren Johnston standing on the drum set riser playing his guitar. ‘I’m Rockin’’ finished out the lead in three songs slamming intro before Jaren stopped to talked to their welcoming crowd. “It’s good to be back in Portsmouth! And I love these guys! 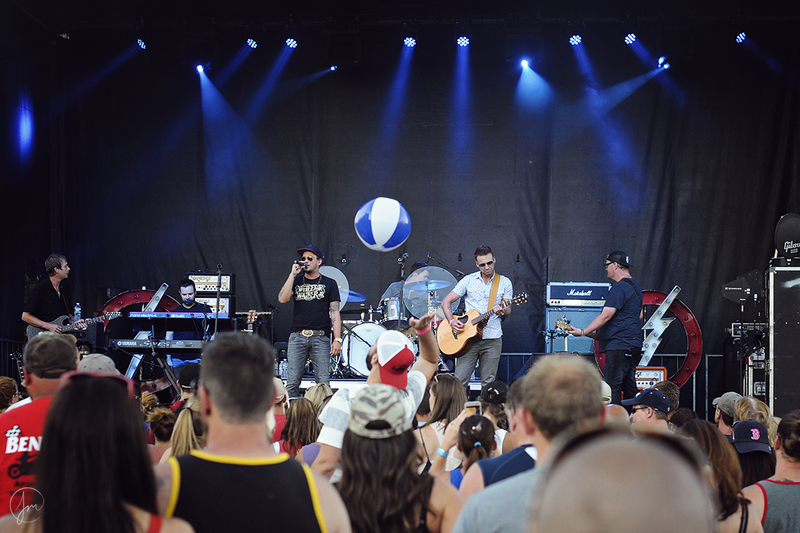 [Love and Theft].” They continued their jam fest with ‘Tennessee Mojo’ which was an automatic crowd pleaser. Jaren quickly stopped again to talk to his crowd in telling them about a story about his day before the fest. “I had some chowdah! And I asked my waitress ‘Can you put some whiskey in my chowdah? !” This got the crowd hysterical in cheers and screams from the New England banter. ‘Back It Up’ was the next song the guys played and of course the crowd was dancing along like no tomorrow. But shortly after the guys stopped after the song to talk again to the audience. “We do love it up here, we’re so home when we’re here and we’re a long way from the house.” They made jokes about no one acting up and getting arrested for the remainder of the festival, but they said that if they were in the crowd watching they would be the ones getting arrested. To slow the tempo a bit, TC3 played they’re infamous ‘White Lighting’ which Jaren dedicated to NECM’s very own Chris Whynock and his wife because it was their wedding song. Jaren took the time to point out the couple in saying “that’s what love looks like right there!” and pointed in their direction. The fans were singing the song right along with the band with soft swaying. To continue on with the slow pace was ‘Life.’ The eighth song in their set was a song that was written with Jerrod Niemann and is off the new record. It is titled ‘Shipfaced’ – an extremely appealing song to the crowd that was dancing and holding their drinks up to the stage. ‘Peace, Love and Dixie’ followed up the drinking oath. Jaren took the time to thank his venue and NECM Harbor Productions when he said “thanks to Redhook and to everyone who put this all together… I’m a little slurry because I’ve been hanging out at the Redhook Brewery all day!” A round of applause and cheering followed this testament. The final two songs seemed to be the audience’s favorites. ‘Days of Gold,’ a song they wrote and was recorded by Jake Owen, riled up a “USA!” chant and rocking drum and guitar solos. Last but not least, their notorious and most popular song ‘The South’ was performed. However, before the guys even began playing their instruments the entire crowd started singing the chorus repeatedly to the band as the band typically leads in their live performances. The guys didn’t want to start the instrumentals over the crowd singing so this went on for a little bit. During this song the crowd had their hands up in the rock-n-roll formation and was jamming out. Towards the end of the song Jaren, Kelby, and Neil came out from behind their instruments, walked to the front of the stage and a started stomping their feet to the beat of the song. The entire crowd and the guys were singing the chorus over and over again and the entire festival area was singing acapella together. 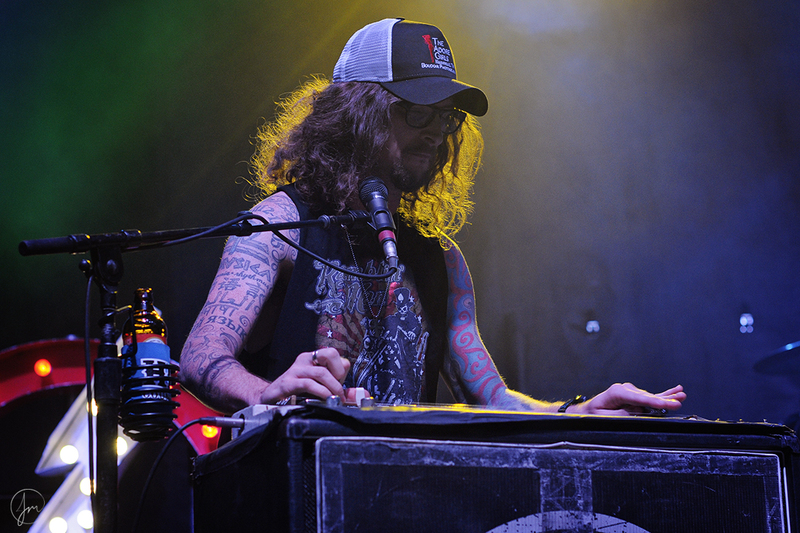 It was as if for that one moment in time everyone was a part of The Cadillac Three. There was no better way to close out the second annual New England Country Music Festival than with them. From everyone here at NECM, The Harbor Agency, and Redhook Brewery, we hope you enjoyed the Second Annual New England Country Music Festival presented by The Harbor Agency. Thank you to everyone who spent their Sunday with us at Redhook Brewery in Portsmouth, New Hampshire. We look forward to seeing you all next year. This entry was posted in Home page blog, Recaps on August 29, 2016 by LaurenNECM.